This post is continuation from previous post about how to Create crossover cable. Build computer network is not so difficult, not as hard as we imagine, it only needs little knowledge about networking. So, if you want to know how to setup computer network using two computers, do not stop reading this post. 1. Plug crossover cable to both of the computer and confirm Network Card indicator light is lighting. 3. Choose Internet Protocol (TCP/IP) then click Properties - Fill the IP Address with 192.168.0.1 and Subnet Mask with 255.255.255.0 like image below then click OK.
4. 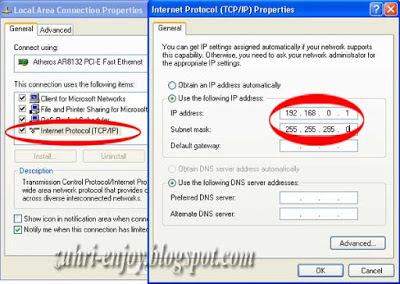 Repeat step number 3 above for the Second Computer but change the IP Address using 192.168.0.2 because IP Address must not be same. 6. Press OK to end the process, it usually needs to restart your computer. Your computer network are ready to use.